China's central bank, which strictly controls the currency, described the move as temporary and meant to make the value of the yuan more market-oriented. "Looking at the international and domestic economic situation, currently there is no basis for a sustained depreciation trend for the yuan," the bank said Wednesday. A day after the yuan's trading band was loosened, resulting in about a 5 percent slide of the currency in global trading, Vietnam followed suit and widened the trading band around the dong. However, the International Monetary Fund said the devaluation "appears to be a welcome step." "The exact impact will depend on how the new mechanism is implemented in practice," an IMF spokesman said in a statement. "Greater exchange rate flexibility is important for China as it strives to give market forces a decisive role in the economy and is rapidly integrating into global financial markets." 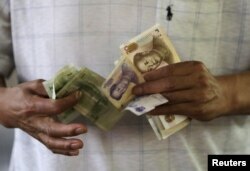 China would like the yuan to be included in the IMF's basket of traded currencies. Thus, a move to allow it to fluctuate more freely will likely be seen favorably by the IMF ahead of its decision next year on the yuan. Trader Anthony Riccio works on the floor of the New York Stock Exchange Tuesday, Aug. 11, 2015. Prices for oil and copper fell sharply after China's government lowered the value of its currency. The devaluation of the Chinese yuan received a cautious reaction Tuesday in the U.S., which has long accused Beijing of keeping the value of its currency low to give Chinese exporters an unfair advantage. U.S. Senator Chuck Schumer, a longtime critic of China's monetary policy, said the move is further evidence Beijing is artificially devaluing its currency. 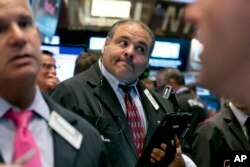 However, the U.S. Treasury said it is too soon to determine implications of the move. The change follows slumping exports and stock market turmoil in the world’s second-largest economy.